One of my favorite times of the day is bath time. At first I bathed the babies separately by putting them in this bath that sits inside our claw foot tub. Because they both love playing and splashing in the water, I recently started to use these little newborn bath chairs so that they could enjoy bath time together. It's so sweet to see them splash around together. Wow I will have to keep this in mind when I have grandchildren! Your bathroom is so pretty! Bath time was always a favorite in our house when the girls were little, especially if they got to use the "big" tub as they like to call it. ... and there will bee so much more splashing around coming your way!! Very cute. Love the pop of yellow, you always have the best, natural looking floral arrangements! Reminds me of how my mother always found a way to have fresh cut flowers from the garden in the house.... hmmm, I miss that! Wow, I love both of those bath "accessories." Simple but ingenious. Both of my "babies" are in their 40's, but I'm bookmarking those items for the next time I need a baby shower gift. PS - Your bath is lovely! I'd love a soak in that beautiful tub. I am new to your blog but I feel right at home, I identify with the look of clean white walls, pine floors and beautiful natural accents. 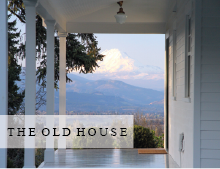 You are living my dream, to take an old house and bring it back to life- I keep a vision tucked away that I hope I am able to one day live out, but in the meantime following blogs and pictures such as yours is almost as good as being there (without all the work!!) Thank you for such an enjoyable journey!! Trina, I am soooo glad that I came across your blog it is wonderful! I love your style and clean look. Thanks for sharing. I am sure your vey busy with your sweet children aren't they the highlight to your day? mine are. I am so glad that I came across your blog your style is wonderful! I too love bath time. thanks for sharing. Love it! We also have a white claw foot tub in our 1917 cottage, and I was wondering what product you used to clean it? We are trying to make the switch over to all-natural chemical-free cleaning products. We use Mrs. Myers! It's surface scrub and works well if you keep up on regular cleanings. I used the same 'chair' for my son in our kitchen sink until he was almost 10 months old. I LOVED it, and recommend it to every one of my preggo friends. Such a bargain too! My two little grandsons, Sam and Freddie, love to have a bath together and there's so much splashing and laughter...great fun! i LOVE baby bathtime!!! they look so cute and so fresh with wet hair and suds! 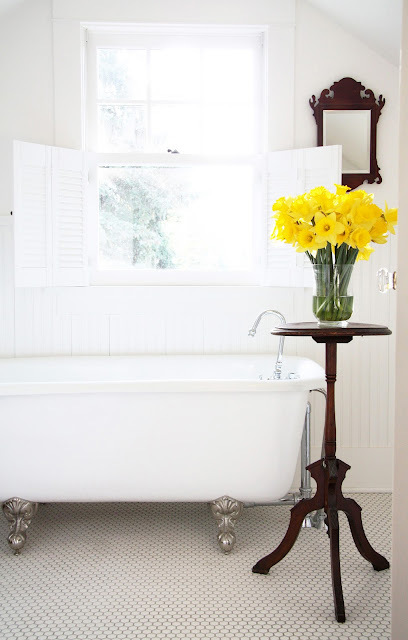 Love your bathroom........the yellow flowers really add a great touch. My friend puts each baby in their own laundry basket in the tub. I love the claw foot tub.. I bet they smell delicious!!! I also love baths for mommy... since I can hear my young guys playing in the room right next to me! Those look great. I bet they are adorable splashing in the tub. Love the bathroom. So very pretty. Your bathroom is so pretty -- I love your aesthetic. Do the bath chairs nest? Only mothers of twins can appreciate that! Love that they're white too. Why didn't I know about these when my twins were babies? Love claw foot tubs and can picture your little ones in there splashing around discovering water. What fun. BTW have you visited a blog site called Posie Gets Cosy. She has the most absolute adorable knitted outfits for babies. Scroll down on the right side and choose baby things. I can just see your little ones dressed in these outfits. trina, those little bath tubs and chairs are so precious! i'd never seen anything like them - just perfect. i bet your sweet darlings just love bath time too! Baby splashes...and squeaky clean little butterballs...nuthin' better! Oh, I just love your bathroom. The window is stunning. Gosh, I'm jealous! You have a beautiful home, and I just love the style. I'm sure your little ones love taking a bath together. You have great style! I love how the crisp white in the room makes the daffodils really pop! It's lovely! Makes me get even more excited to renovate our old house!